Microgaming invites players to go on a wild ride with the Crazy Chameleons as they hit the beach to enjoy the sun, the waves and the beach. So get your swimsuit ready and get ready for the most exciting and the most rewarding beach experience with the Crazy Chameleons. These Chameleons know how to have fun, this is why all of the symbols that will land on the slot machine’s reels and lines are inspired by the crazy beach life. The symbols include a swimming suit, a crazy green chameleon, the sun, a seagull, surfing boards, a wild symbol and card symbols. 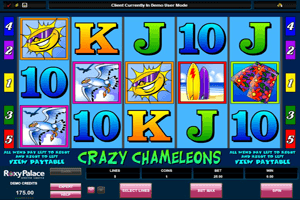 Play Crazy Chameleons Slot here. These symbols will land on the five reels of the game and the 5 paylines of the game. They all come in great visuals and the game itself comes accompanied by great sounds as well. In order for players to get paid, they will have to form a winning combo that includes at least three matching symbols on consecutive reels on a payline from the left reel to the right reel. The payouts that the game can offer can be viewed at the paytable of the game. The game also has a special icon, which is the Wild Sky symbol. When this symbol lands anywhere on the reels, players know they are in for a great pay because it will substitute for other icons on the reels in order to help players get paid by forming a winning combo.